here is a pedagogic chasm between monomodal literacy practices of the past, still dominating most children’s school experience, and the multimodal, dynamic publishing practices that children increasingly routinely engage in with new media and online spaces. 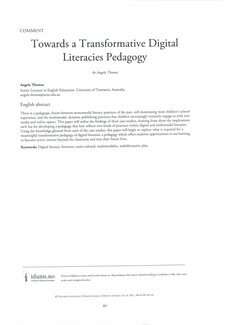 This paper will utilise the findings of three case studies, drawing from them the implications each has for developing a pedagogy that best reflects new kinds of practices within digital and multimodal literacies. Using the knowledge gleaned from each of the case studies, this paper will begin to explore what is required for a meaningful transformative pedagogy of digital literacies: a pedagogy which offers students opportunities to use learning to become active citizens beyond the classroom and into their future lives.